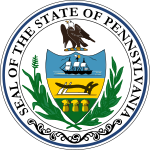 The Pennsylvania gubernatorial election of 1799 was between two candidates. Incumbent governor Thomas Mifflin was not running. The race was between Federalist U.S. Senator James Ross and Democratic-Republican Thomas McKean. The retired Chief Justice of the Pennsylvania Supreme Court, McKean was a Federalist and a Mifflin ally, as both supported strong state executive power but rejected the domestic policies of the national government. ^ Miller, Herman P; Baker, W. Harry (1911). Smull's Legislative Handbook and Manual of the State of Pennsylvania. Harrisburg: State of Pennsylvania. p. 542. This page was last edited on 17 January 2019, at 01:33 (UTC).